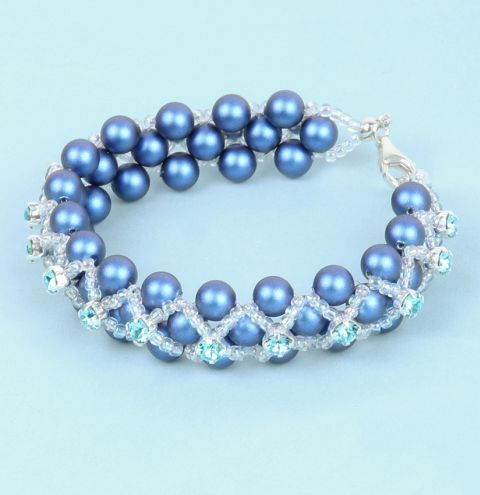 Create a stunning beaded bracelet using Swarovski pearls, seed beads and crystal montees. Cut four 65cm pieces of monofilament. Tie them all together right at one end with an overhand knot. Make the knot bigger by tying a second knot over the top. Thread all four strands through a calotte and a single seed bead. Add a dab of clear nail polish or glue to the knot and close the calotte around it. Trim off the tails flush to the calotte. Separate the strands into pairs. Onto each pair thread four seed beads. Add a pearl by passing the pairs of strands through it in opposite directions. Take a strand from each pair and thread a single pearl onto them. Add another pearl by passing the two strands through it in opposite directions – pull tight. The two unused strands will be used to add the montees decoration later. Add further pearls in the same way until you have the desired length – 40 pearls will make a standard size bracelet. Finish by adding four seed beads onto each strand then pass both strands in the same direction through a single seed bead. Add a bit of sticky tape across the strands to prevent the beads coming off. Now go back to the unused strands. Onto one strand, string three seed beads, a montee and three seed beads. Take the strand diagonally across the bracelet then pass it through the middle pearl. Onto the other unused strand, string three seed beads then pass it through the montee making sure the montee is the correct way up. Onto the same strand, string three seed beads then pass it through the middle pearl. Repeat steps 5 and 6 to add the rest of the montees. At the end of the bracelet pass the two strands through the seed beads added in step 4. Thread all four strands through the back of a calotte. Check there are no gaps between the beads then tie the four strands in a loose overhand knot. Use a pin to guide the knot into the centre of the calotte. Tie a second knot, add a dab of clear nail polish then close the calotte around it. Trim off the tails flush to the calotte. To attach the clasp to the calotte, open a jump ring. Grip it either side of the join with pliers then using a twisting motion bring one hand towards you and push the other away so that the ring opens just like a gate. Pass it through the loop on the calotte and slip on the clasp. Close the jump ring using the reverse action. Add a single jump ring to the other end or attach the other side of your clasp in the same way if it is a 2 piece clasp.